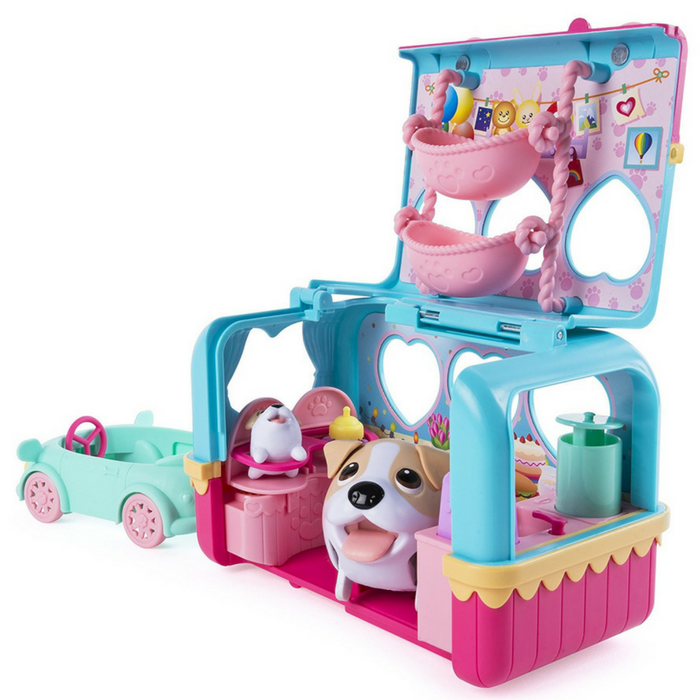 Chubby Puppies Vacation Camper Playset Just $11.89! Down From $25! You are here: Home / Great Deals / Amazon Deals / Chubby Puppies Vacation Camper Playset Just $11.89! Down From $25! Head over to Amazon where you can score this Chubby Puppies Vacation Camper Playset for just $11.89 down from $24.99 PLUS FREE shipping with Amazon Prime or for orders over $25! Let’s go camping with the Chubby Puppies & Friends! This Vacation Camper Playset includes a full-sized Jack Russell Terrier Chubby Puppy and a small baby puppy to care for. These adorable puppies come equipped with the ultimate camping accessory — a transforming camper! This RV includes puppy-powered moving pots and toaster in the kitchen, a swinging baby hammock to keep baby happy, and a removable seat to tuck baby into for the long drive. Collect all of the Chubby Puppies & Friends campers for an adorable, relaxing puppy camping trip. Adopt your Chubby Puppy Jack Russell Terrier and baby puppy today! This Chubby Puppy Jack Russell Terrier and their puppy baby are stumbling, fumbling, tumbling cuteness you’ll fall for! This Vacation Camper Playset transforms from mobile RV to camping playset — complete with a swinging hammock and puppy-powered kitchen. Collect all of the Chubby Puppies & Friends Camping Pups for an outdoor Chubby Puppies waddle party! Each sold separately. Chubby Puppies & Friends are for ages 4+. Includes 1 AAA battery.